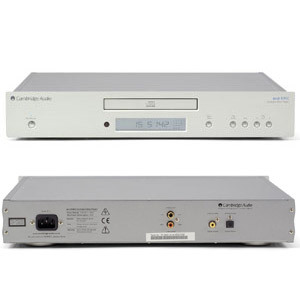 Description: Wolfson WM8740 24-bit/192kHz DAC, 117dB S/N ratio -88dB THD, low jitter clock with data reclocking, separate power supply for DAC, custom Cambridge Audio servo solution, co-axial and optical digital outputs, proven Sony laser optics, custom Cambridge Audio transport, low-resonance and acoustically damped chassis, all-metal casework with a solid aluminum front panel, slim-line Azur remote control with aluminum top panel. What I can say is that I am exceedingly happy with this system. I’ve had no problems whatsoever, and with the music I tend to play on it, and in my room, the system simply sounds superb! At the same time, I feel that there are such large differences between systems, and in particular, that there are such dependencies on the music one tends to listen to, that anyone who considers buying a system should forget all they’ve read, and go out and listen to many types of systems themselves, figure out what they get for what price, and figure out what kind of price and performance make sense for *them*. However, that said, I have been a bit disappointed not with the sound, but the usability of the products. With 3 boxes (Amp, CD player, DAB radio), I got 3 remote controls, where I would have preferred one. For the CD player, seeking (continuous forward or backward), isn’t nearly as nice to use as on the el-cheapo Sony I bought over 10 years ago. The blue power leds are switched on both on standby and when they’re actually switched on (different intensities, though, but couldn’t they be SWITCHED OFF when I put the system on standby?). And then there are completely useless features such as *dimming* the lights from the remote control. Please take a few lessons from Apple regarding simplicity, and easy of use, would you? But concerning the sound, I am totally totally totally satisfied. As I said, I selected this system on sound, and *cough* price. When it comes to that, it’s as simple as that: I got the very best system I could find for a price I could live with. And my music collection lives like it has never lived before. I love this system. Top Ranked Products from Cambridge Audio. I have been a proud owner of a 640C CD Player for just over 2 Years. I have paired the unit with the matching 640V2 Amp and Monitor Audio Silver 8′s. These components can really produce an amazing sound that far outweighs their price. It is very important your speker match is good. These components are not suited to ultra bright speakers as they already produce a very clinical and defined sound. If you mate these with a naturally warmer speaker i.e. UK and pay the cash for cables that are seemingly above the level of components ($300 – $500). you will find it hard to find a system with an audible improvement for double the price. My previous system was Tannoy 15″ Westminster monitors, Quad 402 Amp and pre Amp etc. Probably had a replacement price close to $30,000.00. In weighing up all of the pro’s and con’s sonically the above system was better at less than a third of the price. I have made my mistakes and costly ones over the years. I’ve purchased and run close to 12 amps, 14 sets of speakers and manufactured my own speakers. I used to professionally install and provision high end audio systems for multi level, multi room applications . I am qualified when I say if the above is set up correctly you will have an impressive sound that will evoke emotion.